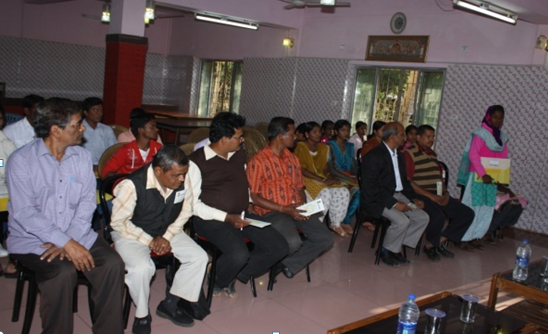 DIGJYOTI scholarship awardees alongwith representatives of sponsoring Orphanages, Sevashrams and social activists from different parts of Odisha gathered early in the morning of December 23,2012 at the OUAT Guest House in Bhubaneswar- the venue of the interaction. Soon after the morning chores & registration, the participants were taken on a study tour to the Planetarium and Science Park where they spent the whole forenoon fathoming the vast universe and the intricacies of scientific inventions. Next two hours were spent by their much awaited mutual exchange of pleasantries, sharing tales of happiness and vicissitudes in life and unfolding of dreams of their visions and goals. 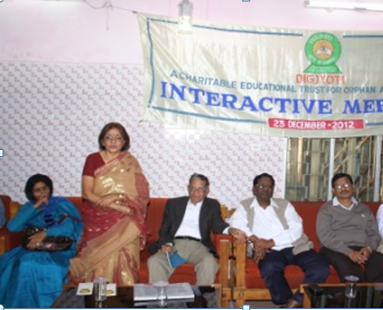 The plenary session of the interaction began at 2.30 P.M as scheduled which was presided over by Prof. D.P. Ray, the outgoing Vice Chancellor of the Orissa University of Agriculture and Technology, OUAT, Bhubaneswar. 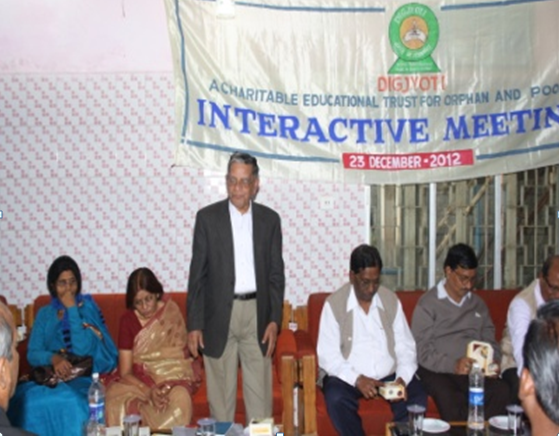 Following a brief introduction by Mr. B.C Das, Trustee Member, the Chairman of Digjyoti, Prof. Khageswar Pradhan dwelt upon the mission of the Trust – his dream child; his experience over the years with the orphanages and organizations in realizing the objectives; the ecstasy of his joy in watching the Trust assisted children established in life; and the future projections by way of adding newer scholarships apart from the ongoing assistance program touching 2.5 Lakhs per annum. Of the children who received DIGJYOTI’s educational assistance since 2006, Hiramati, Mohan, Maya, Harish, Chaitanya and Bipin after completing their studies have got jobs and getting settled in life. He expressed his fond hope that the children will develop a strong fraternity for espousing the cause of DIGJYOTI family which they belong. Responding to the call of the founder, the participating awardees spoke in all earnestness the progress they are making in achieving their goals while expressing their deep sense of emotional attachment to the organization. The scene was touching indeed. The representatives of Orphanages, Sevashramas, Seva Sanghas and social activists from across the state also expressed their views on various ways of attending the need of orphanages and orphans. Mr Khagendra Nayak narrated the harrowing experience in managing their Balashrams and Kanyashrams with the very scanty grant from Government. He acknowledged the educational assistance from DIGJYOTI which helped two of their orphan inmates – Bipin and Hiramati completing their education and getting recruited in Government jobs. He pleaded for continued assistance to their socially challenged tribal inmates especially of Saura community who are way behind economically and socially. Similarly Sri Nanda Kishore Samal of Grama Mangala Pathagar and Sri Budhadeva Swain of Jagatbandhu Biswabharati Siksha Niketan from Bolangir district who are associated with DIGJYOTI right from its inception in 2006, pleaded for award of more scholarships for their orphan and poor inmates who come from economically backward area of western Odisha. Mr. Om Prakash Agarwal from Nehru Seva Sangh which was established by Santh Harihar Ramji in the year 1946, hailed the vision and mission of DIGJYOTI which has been assisting orphans, tribals and handicapped inmates of their Sangha since last two years. He also offered his service for obtaining permission to accept foreign contribution, if required. Ms Deepanjali Mishra of Sabalakana High School who has been associated with the organization for the last 3 years to help finding poor meritorious children from rural areas for educational assistance, also promised her unstinted cooperation for espousing its mission. Mrs. Sucheta Pradhan, Trustee highlighted the objectives of the Trust at length and said DIGJYOTI is not a philanthropic organization with religious sentiments but a forum to provide succor to those socially, physically and economically challenged meritorious children in our society for establishing them in life and securing a meaningful and honourable place in society. She hoped that the DIGJYOTIANS will be a force to be reckoned with. 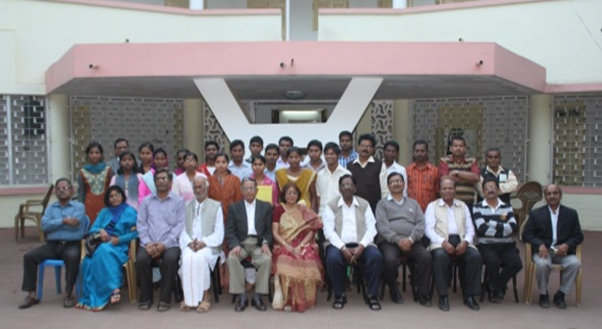 Also, Dr. S. Nanda, Dean of Extension Education; Prof. P.C. Lenka, a member of the Trust; Prof. Santosh Ku. Rout, a founding associate and Dr. Manoranjan Roy a member of the selection committee of the Trust spoke and gave valuable advice to the children for taking advantage of the assistance programme of the Trust to stand themselves good stead in life. Before winding up the proceedings, Prof. D.P. Ray called upon the children to rise to the expectation of the Trust and continue pursuing their studies with determination of competing with others so that they get settled in life. Finally, the day long interaction ended in a happy note with the Founder Chairman of DIGJYOTI, Prof. Pradhan extending his appreciation and thanks to Dr.D.P.Ray and other University officers, representatives of various orphanages, Seva Sanghas, Social Organizations and social activists for their active cooperation and wishing a Happy and Prosperous New Year 2013 to everyone.